A few of you emailed and asked me about our swim diaper. I first learned about swim diapers when I worked at an earth-friendly baby website. Although I do not cloth diaper, the concept appealed to me. A did a bunch of research and read reviews on traditional swim diapers, but all of them seemed to have some aspect that I didn't like. The prints were ugly, or the sizes available weren't right. Or they pulled on, which means if they do get messy, they are harder to get off. I ended up reading a post on cloth diapering at StyleBerry and she mentioned that she used a GroVia Hybrid diaper (without an insert) for the pool. Since I had so much success with her baby food system, I thought I would trust her and give it a try. -They are more environmentally friendly, no trash! I usually bring H to the pool in just a regular diaper and cover up. 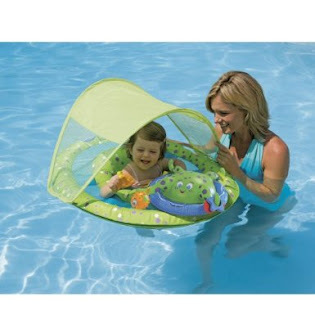 Then I clay her on a towel and change her into her swim diaper and bathing suit at the pool. When we are done I put her suit and swim diaper in a wet bag and put a dry diaper and her cover up back on. The thing about swim diapers is that they are not absorbent, so pee will just go right through it. They are designed to hold in BM's, and they don't hold liquid, which is actually the nice part. 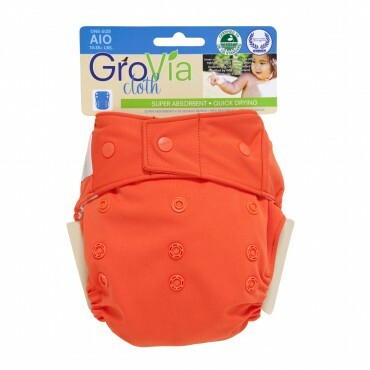 No soggy diaper to break apart or weigh baby down! After the pool I rinse the diaper in soap water (or put it in the washer on delicate) and lay it flat to dry. They dry very quickly and are ready for the next day's swim. I do have 2 of them, because on vacation we will often swim before and after nap time, and I wanted a clean, dry diaper each time. And if you are looking for a pool float, we had good luck with this Swimways one from Amazon last year. We used it all Summer, and even packed it in a suitcase for a trip to Palm Springs. Ha! I was going to email you yesterday about the swim diaper but forgot! I need to get one of those!! We use the bumgenius cloth diapers and when she is swimming we just use those as her swim diaper too - works perfect!